Korsteel bits are proven performers for all levels of training and competition. They are crafted from materials of the highest quality. 13mm mouthpiece. The unique Apple Scented Mouthpiece encourages horses to accept the bit. Space age polymer provides a gentler bit for a happier horse. 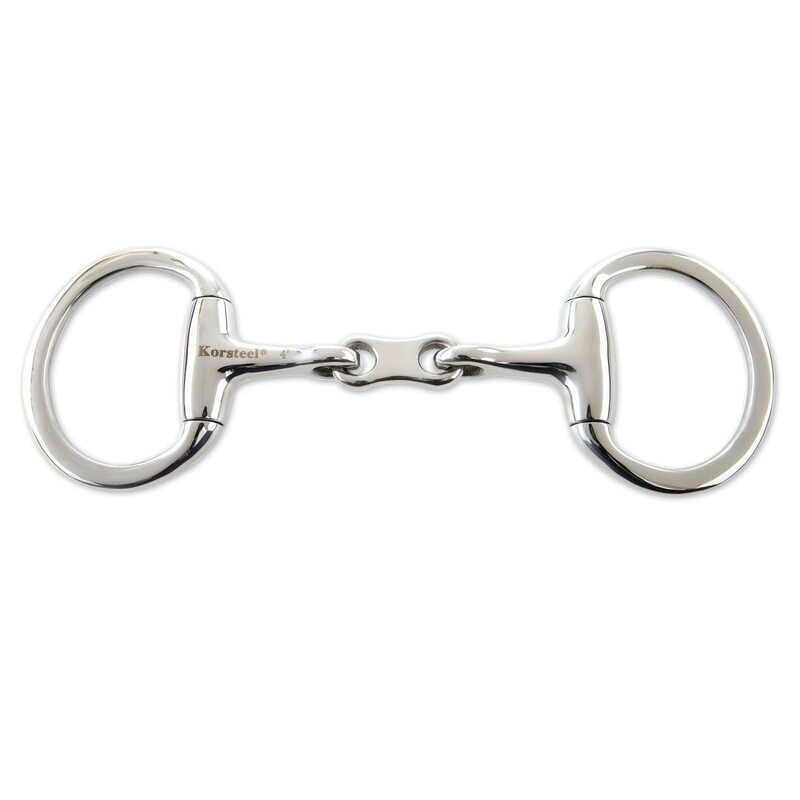 Korsteel French Mouth Eggbutt Snaffle is rated 4.8 out of 5 by 72. Rated 5 out of 5 by 1Saddlebredgirl from Nice quiet working horse Great price, great function and my horse who was fiddling constantly on his copper roller snaffle bit now works much more quietly. Plan to buy for my other geldings. Rated 5 out of 5 by SQuake from Awesome quality bit! I bought two of these for my mares and they are awesome. Nice thick mouth pieces, flexes well, easy to clean. Love them! Rated 5 out of 5 by SuemTX from Great value for price My horse seems to be responding to this bit better than any of the other bits I’ve tried. Rated 5 out of 5 by LivS from Very light, love! My Warmblood dressage horse responded very well to this bit, I think the lightness of it really helps with comfort. I definetly recommend this for a horse who likes something lighter! Rated 5 out of 5 by Mdlong from Looks great and perfect fit Have used three times and really like the way it looks. Comfortable in horses mouth. Highly recommend. Rated 5 out of 5 by Emma from Nice Nice quality bit, especially for the price. I got it because I felt my D-ring interfered too much with my horse’s Micklem. It fits much nicer with the eggbutt and you can’t go wrong with a French link! Rated 5 out of 5 by Arab1 from Fits my Arab My 5 yr. old Arab gelding has a very narrow mouth. He does not have much room in his palate for a bit that is thick. He appears to like this bit and responds well. He does not play with it as much as the link with the lozenge in the center. Rated 5 out of 5 by OlderSlowerSaner from Outstanding!! Moved my mare from single joint O-ring to this one and it has made a real difference. The old bit had copper inlays, but this one wo/copper keeps her mouth much more moist, even frothy, and she is more relaxed; no period of adjustment, she took to it right away. My trainer really likes it too. Rated 5 out of 5 by indiemusicgirl from I got this for a great price We switched my horse to this French link style a while ago and she loves it. She has a low pallet, and seems very comfortable in this. The 5 1/2 I have in the Albacon is a little to big for her, and this is one of the only manufacturers that makes a 5 1/4. It is a very nice product. Rated 4 out of 5 by JanetC from Nice bit but not for my pony This is a well made bit and extremely mild for sensitive horses. My pony didn't like it as much as her jp korsteel copper link bit, but another horse in the barn absolutely loved it!